June 11 - Saint Barnabas the Apostle - Memorial - My Catholic Life! Today’s saint was an Apostle in the exact same sense in which St. Paul was an Apostle. Saint Barnabas was not one of the Twelve original followers of Christ nor a replacement for one of the Twelve, like St. Matthias. But the term “The Twelve” quickly disappears after the era of the New Testament, because “The Twelve” themselves propagate into dozens, hundreds, and then thousands of successor Apostles, known alternatively as Episcopoi or Prebyteroi: Overseers or Elders. Saint Barnabas is among that generation of Christian leaders whose name first surfaces immediately after the Resurrection. So although he was not in the circle of “The Twelve,” he stood in the next outer ring. The earliest name for the movement following Jesus of Nazareth was “The Way.” This term is used in the Acts of the Apostles and in the ancient catechetical document known as the Didache. But “The Way” was replaced early on by another term. The Acts of the Apostles explains: “Then Barnabas went to Tarsus to look for Saul, and when he had found him, he brought him to Antioch. So it was that for an entire year they met with the church and taught a great many people, and it was in Antioch that the disciples were first called ‘Christians’” (Acts 11:25-26). We owe Saint Barnabas, then, the credit for the word “Christian” as the standard description of the followers of Jesus Christ. The persecution and martyrdom of St. Stephen forced many Christian leaders to flee Jerusalem. The unforeseen effect of Stephen’s assassination and the subsequent persecution of Christians was the spread of the Gospel into greater Syria, the Greek islands, and North Africa. This expansion led to contact with Greek and Roman Gentiles, or non-Jews, a growth presaging the transformation of Christianity from a localized Jewish sect into a multiethnic worldwide Church. When some converts from North Africa and Cyprus went to Antioch, the capital of the Roman province of Syria, they converted a great number of Greek speakers. And when “news of this came to the ears of the church in Jerusalem…they sent Barnabas to Antioch. When he came and saw the grace of God, he rejoiced, and he exhorted them all to remain faithful to the Lord with steadfast devotion; for he was a good man, full of the Holy Spirit and of faith” (Acts 11: 22-24). 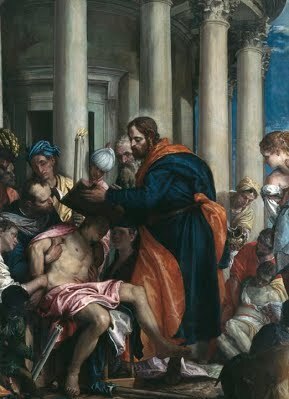 Saint Barnabas played a crucial role in the first unfurling of the Gospel message beyond Palestine. Acting as a kind of talent scout, he lassoed Saul from his hometown of Tarsus to begin the extraordinary missionary efforts which would forever change the Church and the world. Saint Paul and Saint Barnabas are repeatedly mentioned together in the Acts of the Apostles as they traverse the ports, the waters, and the dusty highways of the eastern Mediterranean world. Together, they call down the Holy Spirit, commission new Apostles, confront Jews and Roman citizens alike, challenge a magician, speak to governors, and, of utmost consequence for the Church’s future, they convince the other Apostles not to force new converts to become Jews first and Christians later. Saint Barnabas was a dynamic force of nature who rushed like a tornado from town to town in the early Church. He was a giant of that first generation of risk-taking, manly, apostolic leaders. The citizens of Lystra in Asia Minor compared him to the Greek God Zeus. They tried to crown him with garlands and to sacrifice the blood of oxen to both him and Saint Paul (Acts 14:12-18). After numerous adventures in tandem, Paul, the better preacher, writer, and organizer, ultimately sails off on his own. The last we hear of Barnabas, he is returning to the island of Cyprus. When Saint Paul writes from his Roman prison in about 62 A.D., he mentions that Mark, the cousin of Barnabas, is with him (Colossians 4:10). Barnabas’ absence at Paul’s side in his hour of need is a clue that Barnabas is likely dead by the year 62. Tradition tells us that Barnabas was martyred on Cyprus, perhaps by a Jewish mob angered at his successful preaching in the synagogue of Salamis. His relics and memory are particularly honored on Cyprus even to this day. Saint Barnabas, you gathered infant Christianity from its cradle and carried it into the world beyond. You poured the message of salvation into new wineskins without any guile. May all Christians be so confident, so convincing, and so successful through your intercession. WE read that in the first days of the Church, “the multitude of believers had but one heart and one soul; neither did any one say that aught of the things which he possessed was his own.” Of this fervent company, one only is singled out by name, Joseph, a rich Levite, from Cyprus. “He having land sold it, and brought the price and laid it at the feet of the apostles.” They now gave him a new name, Barnabas, the son of consolation. He was a good man, full of the Holy Ghost and of faith, and was soon chosen for an important mission to the rapidly-growing Church of Antioch. Here he perceived the great work which was to be done among the Greeks, so he hastened to fetch St. Paul from his retirement at Tarsus. It was at Antioch that the two Saints were called to the apostolate of the Gentiles, and hence they set out together to Cyprus and the cities of Asia Minor. Their preaching struck men with amazement, and some cried out, “The gods are come down to us in the likeness of men,” calling Paul Mercury, and Barnabas Jupiter. The Saints travelled together to the Council of Jerusalem, but shortly after this they parted. When Agabus prophesied a great famine, Barnabas, no longer rich, was chosen by the faithful at Antioch as most fit to bear, with St. Paul, their generous offerings to the Church of Jerusalem. The gentle Barnabas, keeping with him John, surnamed Mark, whom St. Paul distrusted, betook himself to Cyprus, where the sacred history leaves him; and here, at a later period, he won his martyr’s crown. Reflection.—St. Barnabas’s life is full of suggestions to us who live in days when once more the abundant alms of the faithful are sorely needed by the whole Church, from the Sovereign Pontiff to the poor children in our streets.